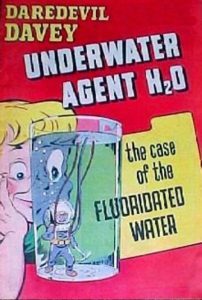 If you still think that all those fluoride containing dental products endorsed with the American Dental Association (ADA) “seal of approval” indicate some level of product safety, you need to know, it’s a myth. The truth is that fluoride is a known neurotoxin, a chemical that is poisonous and destructive to nerve tissue. Its little known classification as a neurotoxin was highlighted not long ago in a review published in The Lancet, Neurology. Neurotoxic fluoride is in the same category as mercury, lead, PCBs, arsenic, and other industrial chemicals that can cause permanent brain injury during infancy and early childhood. The review’s authors implicated fluoride and other industrial chemicals in the current pandemic of neurodevelopmental disabilities in infants and children – disabilities that include autism, ADHD, dyslexia, and other cognitive impairments. Not only do these impairments affect millions of children worldwide now; statistics indicate these disorders are increasing in frequency. With multiple studies indicating fluoride has a permanent effect on our children’s brain development, a time-sensitive petition has been launched so citizens can voice their support for a formal petition delivered to the EPA earlier this year by a coalition of environmental, medical, and health groups, urging an end to municipal water fluoridation. We encourage you to sign it and share it widely. the amount of fluoride now regularly consumed by millions of Americans in fluoridated areas exceeds the doses repeatedly linked to IQ loss and other neurotoxic effects. There are good reasons there’s a Poison Control Center warning on every tube of toothpaste. Fluoride is not designed to be swallowed. At all. A nutritious diet, proper hydration, and improvement in oral home care can do far more good than fluoride – and with no harmful side effects.